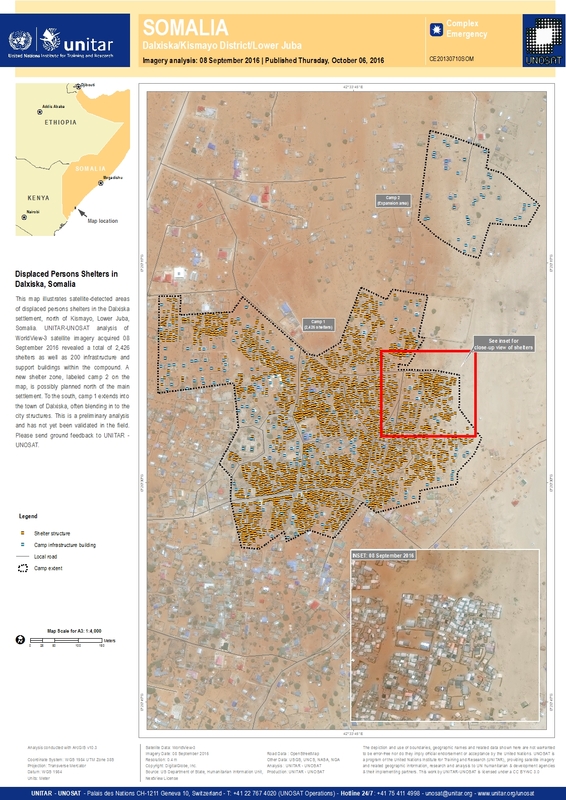 This map illustrates satellite-detected areas of displaced persons shelters in the Dalxiska settlement, north of Kismayo, Lower Juba, Somalia. UNITAR-UNOSAT analysis of WorldView-3 satellite imagery acquired 08 September 2016 revealed a total of 2,426 shelters as well as 200 infrastructure and support buildings within the compound. A new shelter zone, labeled camp 2 on the map, is possibly planned north of the main settlement. To the south, camp 1 extends into the town of Dalxiska, often blending in to the city structures. This is a preliminary analysis and has not yet been validated in the field. Please send ground feedback to UNITAR - UNOSAT.